This course is intended for graduate students, post-docs, or professionals who are interested in learning and applying knowledge about the taxonomy, evolution, and ecology of one of the most conspicuous organisms in tropical benthic ecosystems, marine sponges. The students participating in this course will: (1) learn to describe and identify the most common sponges living on the mangroves and shallow coral reefs of the Bocas del Toro region; (2) learn general biological and ecological characteristics of marine sponges; (3) gain hands-on ecological and taxonomic experience with tropical marine sponges; (4) learn basic ecological survey techniques; and (5) learn how to conduct physiological experiments with sponges. 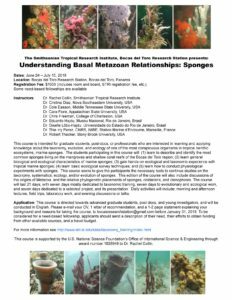 This course seeks to give the participants the necessary tools to continue studies on the taxonomy, systematics, ecology, and/or evolution of sponges. This edition of the course will also include discussions of the origins of Metazoa, and the relative phylogenetic placements of sponges, cnidarians, and ctenophores. The course will last 21 days, with seven days mostly dedicated to taxonomic training, seven days to evolutionary and ecological work, and seven days dedicated to a selected project, and its presentation. Daily activities will include: morning and afternoon lectures, field trips, laboratory work, and evening discussions or talks. Application: This course is directed towards advanced graduate students, post-docs, and young investigators, and will be conducted in English. Please e-mail your CV, 1 letter of recommendation, and a 1-2 page statement explaining your background and reasons for taking the course, to bocasresearchstation@gmail.com before January 31, 2019. To be considered for a need-based fellowship, applicants should send a description of their need, their efforts to obtain funding from other available sources, and a travel budget. For more information see http://www.stri.si.edu/sites/taxonomy_training/index.html. This course is supported by the U.S. National Science Foundation’s Office of International Science & Engineering through award number 1828949 to Dr. Rachel Collin. Please try out a preliminary version of the Porifera OneZoom. This project is supported by the National Science Foundation’s Assembling the Tree of Life program under Grant No. 0829986. Any opinions, findings, and conclusions or recommendations expressed on this website are those of the authors and do not necessarily reflect the views of the National Science Foundation.